It Is What It Is: It's A Monster! Cael is constantly after me to play with my phone, or see Daddy's iPad. The kid seems to have megabytes flowing through his blood and I fear there is little I can do to stop it. The great battle to limit television began raging at age two and has never stopped, and I should have known better than to add another, more advanced dimension. But there was laundry to be done. And dishes. And as much as I love him-- and I do, the kid wouldn't leave me the heck alone. He followed me into the laundry room. He followed me out of the laundry room. If I needed a drink, he needed a drink. And when I had to pee, his bladder was about to burst. So I took a chance and did something we'd never done before. I opened Yahoo and made a quick search for "good websites for kids", although I may as well have searched for "how to sell your soul to the devil". 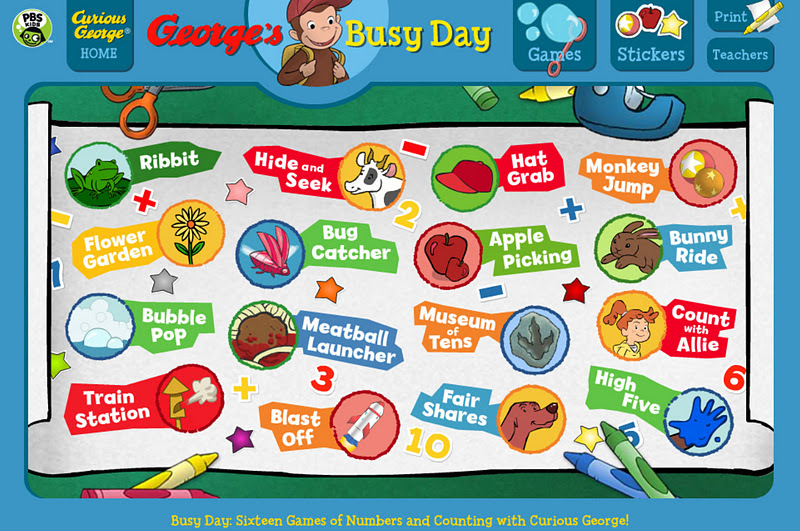 I clicked on the link for the PBS Kids games and saw Curious George's smile light up the page, immediately knowing that Cael would think it was fun to use the computer for himself rather than as another avenue to torment me. At George's main game page was a selection of sixteen educational games from which to choose. I randomly chose a color-themed game about grabbing hats, and although he had difficulty manipulating the mouse for the first time, he was wholly unconcerned with the laundry, his thirst or his selectively bursting bladder. After he'd exhausted the hat game's potential, we returned to the main game hub, and that was when I saw it: A TRAIN GAME. Cael literally jumped out of the desk chair. "Mommy! Mommy! It's a TRAIN game!" "Oh, cool! Let's see what it is about." But once we began the game, I knew it was beyond his current level. While Cael is reliable with letters, he is not interested in numbers or basic math, which was the whole concept around which the game was based. For the next thirty minutes, I witnessed Cael catapult back and forth between locomotive elation and arithmetic annoyance. He wanted help, but wouldn't accept help; torn between his love of trains and what heredity tells me will likely be a hatred for math. Knowing that there was little I could do to pull him from this slump, I suggested we leave the computer for awhile and play with something else. For a moment, I thought he might stab me with the ballpoint pen I'd innocently left out on the desk. So I backed off for a moment, leaving him to mellow out while I went to check on Graham. When I'd left my Bubba, he was happily stacking his colorful buckets and delighting in the novelty of knocking them down, the same action that landed Cael in his first preschool time-out just last week. (I don't have any ownership in that problem, right?) But Graham is still innocent enough that he rarely premeditates naughtiness and still young enough that he is not permanently affixed to the computer screen. Because he was permanently affixed to the television screen. He'd found the stash of remotes and not only selected the appropriate remote, but actually managed to turn on the power to the TV without affecting the satellite feed, a task that I myself can't often achieve. 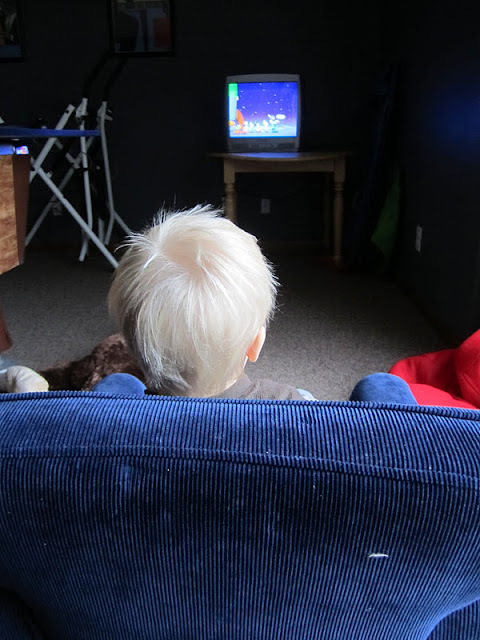 Recognizing that it was recording his favorite program, "Mickey Mouse Clubhose", he pulled up a chair and made himself at home in front of the tube. "Graham? Can we go play with your toys?" "Can I read you a story?" "Would you like to help me do something?" Please, God, don't let them be pasty nerds! Please don't let them be pasty nerds! As the afternoon wore on, I managed to pry both of my boys from their respective addictions, but not without a fight. And what's worse is that it's a battle I know I will fight their entire lives. I want them to be active and healthy, and while I want them to be technologically savvy, I don't want it to rule their existence. Wish me luck.